We work in special schools and SEN units, using nonverbal physical theatre to explore young people’s creativity. We work with the same young people over months, sometimes years, leading to positive impact on learning outcomes, capacity to learn, confidence and sense of self, and the roles they can play in the world. Nonverbal Physical Theatre involves play, simple props, music and movement. It’s a highly adaptive and individual process, and we work with a small pool of specially trained facilitators. All of our practitioners are DBS checked, have Public Liability insurance and up-to-date Safeguarding training. Every school we work with is different, because every child we work with is different. Where possible we work with schools over several years, through residencies where an Open Theatre practitioner is based in the school for one or more days a week. We’re always open to conversations with new schools, and to smaller-scale or one-off projects for us to learn more about each other. 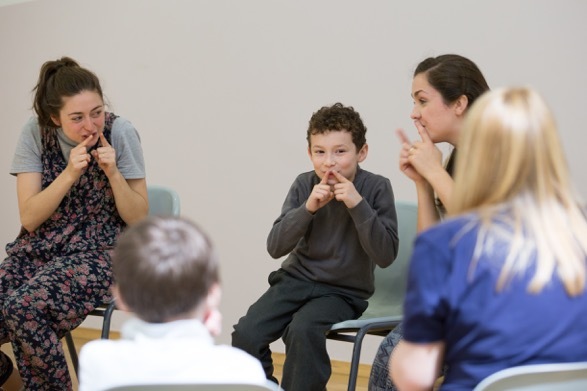 Working with Richard Hayhow has helped us develop the non-verbal communication and social skills of all our children in an entirely new, imaginative and fulfilling way. It has not only enhanced our practice but has given the children an opportunity to develop in a relaxed, non-threatening and creative atmosphere. improved as a result and we look forward to watching the partnership grow.